Iodine is an essential element in thyroid physiology and the accumulation of iodine in the thyroid was found to be a critical step for the synthesis of thyroid hormones as early as 1915. For over a half century, radioiodines have been successfully used in diagnosis and therapy of thyroid disorders such as hyperthyroidism and thyroid cancer [1-3]. Despite advancement in newer targeted therapies, the clinical utilization of radioiodines remains robust in therapeutic management of thyroid function and monitoring outcomes of treatment [4-8]. The mechanism of iodide uptake was not fully elucidated until the NIS gene was cloned in 1996 [9, 10]. This work tremendously improved the understanding of thyroid physiology and enabled new approaches for molecular imaging and treatment [4, 5, 11-14]. Due to the broad availability of SPECT and PET scanners and iodide radiopharmaceuticals ([123/124/131I]I- and [99mTc]TcO4-), NIS has been developed as an imaging reporter gene with great promise for clinical translation [15-18]. Despite the success of [99mTc]TcO4- and radioiodides for use in NIS imaging, there are certain limitations in availability and physical properties of these radioisotopes. These limitations have been largely addressed by the recent development of [18F]TFB for NIS imaging using PET . Initial clinical trials of [18F]TFB have been completed in healthy human subject  and thyroid cancer patients [21, 22]. This review focuses on the development of [18F]TFB and closely related compounds as iodide analogs for PET imaging of NIS expression in tissues. There are a few techniques available for NIS expression monitoring. Currently, SPECT and PET offer the best sensitivity in NIS imaging [23, 24]. Moreover, the integration of SPECT or PET and computed tomography (CT) allows the combination of functional data with detailed anatomical images to generate more accurate localization and quantitative estimated radioactivity concentrations in live subjects [25, 26]. Several iodide radionuclides have been used for noninvasive imaging of NIS expression using SPECT and PET modalities (Table 1). Radionuclides for SPECT and PET imaging of NIS. SPECT is a useful noninvasive imaging technique. Three-dimensional images are obtained by detecting photons emitted from a radionuclide , e.g., technetium-99m or iodine-123/125/131. Technetium-99m has a half-life of 6 h and high abundance of photon emission with desirable energy (98.6%, 141 keV) for medical diagnostic imaging [28, 29]. The anion [99mTc]TcO4- is a good transport substrate for NIS and therefore is useful for NIS imaging using SPECT . Technetium-99m is the daughter product of molybdenum-99 , and is usually eluted from a generator. However, the global shortage of technetium-99m has bothered the medical imaging field in the last two decades due to the fragile supply chain of molybdenum-99 [31-33]. Iodine-123 is the most suitable radioiodine for SPECT imaging of NIS [34-36]. Iodine-123 has a half-life of 13.3 h and 83.3% emitted photon with predominant energy of 159 keV, which is close to technetium-99m . Iodine-123 provides higher sensitivity and imaging quality compared to iodine-125/131. Iodine-125 has limited use in SPECT because of its rather low photon energy (35 keV) and undesirable long half-life (59 d) . [131I]I- can be used as both diagnostic and therapeutic agent [39-41]. Iodine-131 has a half-life of 8 days with two step emission of beta particles (89%, 606 keV) and photon emission (81%, 364 keV), which is too high for optimal imaging with poor quality. The long half-lives of radioiodine in diagnostic imaging resulted in extra exposure for both patient and staff. Meanwhile, all the radioiodides [123/125/131I]I- have limitations of availability due to the requirement of specialized production systems , which are only available in limited sites. 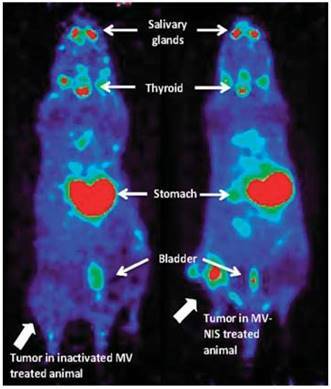 PET is a highly sensitive noninvasive imaging technique that utilizes positron-emitting radiopharmaceuticals. Three-dimensional images are reconstructed from detected pairs of photons (511 keV) emitted upon annihilation of positrons with electrons in tissue. Currently, PET imaging offers the highest imaging sensitivity for detecting low levels of reporter gene expression. 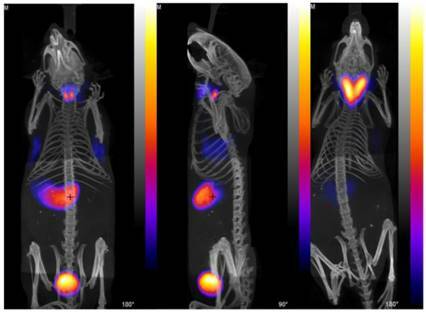 Iodine-124 is a positron-emitting radionuclide  that has been used for NIS imaging using PET and has the advantages of superior quantitation and imaging sensitivity of PET relative to SPECT . However, iodine-124 suffers several drawbacks : 1) its 4.2 d half-life and low positron yield are undesirable for diagnostic imaging as these result in high radiation exposures; 2) its high energy single photon emissions (0.6-1.7 MeV) can degrade image quality; and 3) its high positron emission energy results in >6 mm maximum travel in tissue before annihilation , which degrades imaging resolution. Fluorine-18 is the radionuclide of choice for clinical PET studies . It has a high positron emission yield (98%) and relatively low energy (0.64 MeV), providing a limited maximum distance travelled in tissue before annihilation, which gives excellent resolution. Its half-life of 109.8 min is compatible with typical imaging period, resulting in acceptable radiation exposure levels. Moreover, due to the widespread use of [18F]FDG, fluorine-18 is routinely available in most medical cyclotron centers and PET radiopharmaceutical distribution companies. Therefore, a fluorine-18-based radiotracer for NIS imaging would have great value to overcome many of the limitations of traditional radioiodine and technetium-99m tracers. [18F]TFB has emerged as a promising iodide analog radiotracer for NIS imaging. The tetrafluoroborate (TFB) anion is an analog of iodide with good relative stability under physiological conditions and low toxicity. As early as the 1950's, Anbar et al. [47-49] reported the radiolabeling of [18F]TFB by isotopic exchange using reactor-generated [18F]fluoride on nonradioactive TFB under acidic conditions, and performed in vitro evaluations of competitive binding with other iodide analogs in the early 1960's. Despite the low molar activities obtained in the synthesis, [18F]TFB showed specific accumulation in thyroid and high thyroid-to-blood concentration ratio. This pioneering study suggested its potential for thyroid imaging. However, these studies were done three decades before the advent of clinical PET and even longer before characterization and use of hNIS as gene reporter. Due to the utility of radioiodines and [99mTc]TcO4- in imaging of NIS with SPECT, [18F]TFB was inactive in the literature for half a century despite of its potential. Figure 1 shows a timeline of the inception and development of [18F]TFB as a radiotracer for PET imaging of NIS. The synthesis methods (section 3) and biological evaluation studies (sections 4-5) for [18F]TFB will be reviewed in detail below. Timeline of advancements in [18F]TFB NIS imaging: 1950's to date. Radiosynthesis of [18F]TFB. QMA: quaternary methyl ammonium. K.2.2.2: Kryptofix® 2.2.2. Due to the encouraging experience on NIS imaging with [18F]TFB, other promising fluorine- containing iodide analogs have been explored as potential fluorine-18 labeled NIS probes. [18F]fluorosulfate ([18F]FSO3- ) was obtained in high radiochemical yield and molar activity, and has a similar affinity with [18F]TFB in a NIS-mediated competitive uptake assay . Meanwhile, the hexafluorophosphate (PF6-) ion has been shown the highest known affinity as an inhibitor for NIS transport [50, 51]. More details about the radiochemistry and biological evaluation of these newer fluorine-18 labeled probes will be described in the following sections. In 2010, Jauregui-Osoro et al. updated the isotope exchange radiolabeling of [18F]TFB with modern production of [18F]fluoride using a low energy cyclotron (Figure 2). [18F]TFB was conveniently purified with a disposable silver ion-loaded cation exchange cartridge and two alumina N cartridges, and the quality control was performed by thin-layer chromatography and anion HPLC. Using this simple and practical production method, the molar activity of [18F]TFB reported by Jauregui-Osoro was up to 1 GBq/μmol with a starting activity of 12-18 GBq, which is moderate with respect to molar activities commonly required for receptor-binding radiopharmaceuticals . Also, the 10% radiochemical yield was rather low. Radiosynthesis of [18F]fluorosulfate and [18F]hexafluorophosphate. To achieve higher molar activities of [18F]TFB, Jiang et al. developed a novel approach of [18F]TFB production using fresh boron trifluoride (BF3) (formulated in petroleum ether/tetrahydrofuran 50:1) solution, which was highly reactive with [18F]fluoride (Figure 2). This method allowed a fast formation of [18F]TFB upon passing the BF3 solution at room temperature through a quartenary methyl ammonium (QMA) cartridge containing trapped [18F]fluoride. Molar activity of [18F]TFB of 8.84±0.56 GBq/μmol and radiochemical yield of 20.0±0.7% were obtained with starting activity of 40-44 GBq. Due to the convenient and fast radiofluorination, [18F]TFB was obtained in an overall synthesis time of 10 min. Meanwhile, Khoshnevisan et al. and Volpe et al. reported another approach for synthesis of higher molar activity of [18F]TFB utilizing BF3 as precursor. In their synthesis, the [18F]fluoride starting reagent was in the form of azeotropically dried [18F]KF/K222/K2CO3 and the BF3 was in the form of commercially available BF3•Et2O. The reaction was performed for 10 min at 80 °C. They significantly increased the molar activity of [18F]TFB to 5.7±3.5 GBq/μmol with decay corrected radiochemical yields of 13.2±5.9% from a starting activity of 1.5 GBq. All the reported methods for production of [18F]TFB are summarized in Table 2. The improved methodologies for [18F]TFB synthesis based on BF3 precursor had increased molar activity of [18F]TFB and improved radiochemical yield relative to the isotope-exchange method. It is worthy to mention that all the three approaches are compatible for automation and Good Manufacturing Practices (GMP). However, effects of NIS transport saturation with unlabeled TFB present in [18F]TFB preparations have been observed in in vitro and small animal in vivo studies [19, 52-54, 56]. As shown in Figure 3, two additional fluorine-18 based iodide analogs were synthesized recently. Khoshnevisan et al. reported the synthesis of [18F]fluorosulfate ([18F]FSO3-) ion obtained upon heating of SO3-pyridine complex with dried [18F]KF/K2.2.2/K2CO3. Excellent molar activity of ≥48.5 GBq/μmol and radiochemical yield of 31.6% were obtained starting with 750 MBq of [18F]fluoride. Jiang et al. developed a synthesis of [18F]hexafluorophosphate ([18F]HFP) based on the radiofluorination of PF5/N-Methyl-2-pyrrolidone (PF5•NMP) complex with [18F]KF/K222/K2CO3. Due to the high reactivity of PF5 (even in the presence of NMP), it is likely that hydrolysis leads to moderate levels of [18F]HFP molar activity of 604±18 MBq/μmol and low radiochemical yield (10±5%). Using isotope-exchange labeled [18F]TFB, Jauregui-Osoro et al. 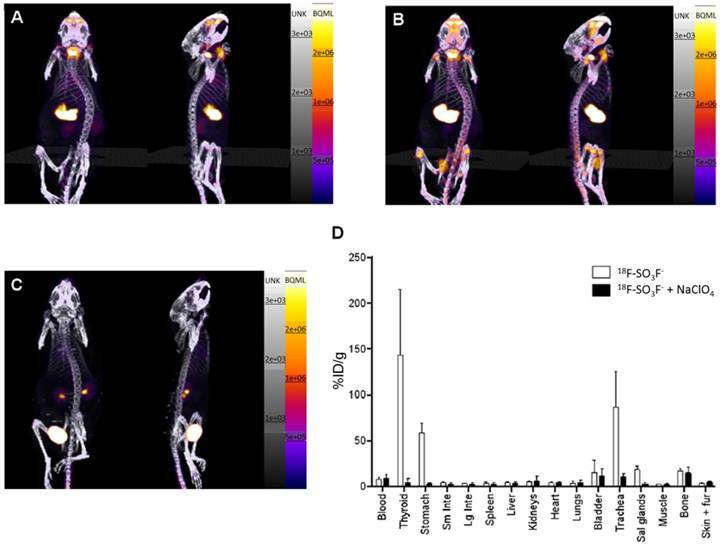 reported in vitro uptake in NIS-expressing FRTL-5 rat thyroid cell lines and PET imaging in BALD/c mice (Figure 4). NIS-specific accumulation of [18F]TFB was observed in NIS-expressing cells and tissues. Despite moderate levels of molar activity, high thyroid uptakes and excellent target-to-background resolution were seen in PET images. The preliminary biological evaluation of [18F]TFB showed that it has a very similar behavior to [99mTc]TcO4-, which justified its further preclinical and clinical evaluation. Summary of [18F]TFB radiosynthesis methods. PET/CT images with [18F]TFB in mice. (Left) Left and center anterior and (center) lateral view maximum intensity projections of normal mouse 30 min after injection of [18F]TFB. (Right) PET/CT image of TRβPV/PV transgenic mouse with thyroid tumor, 30 min after injection with [18F]TFB. Reproduced with permission from , copyright 2010 Springer. 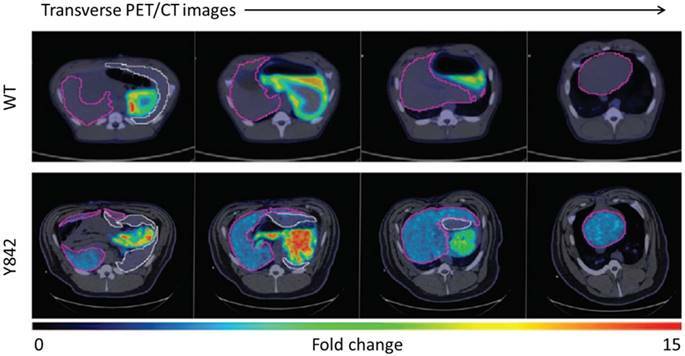 (A-C) PET/CT maximum-intensity projections of BALB/c mice. (A) 25-30 min after injection of [18F]SO3F- without perchlorate; (B) 90-120 min after injection of [18F]FSO3- without perchlorate; (C) 25-30 min after injection of [18F]FSO3- in presence of NaClO4 (250 mg/kg). (D) Ex vivo biodistribution data at 2.25 h after injection (n = 3). Error bars represent SD. Reproduced with permission from , copyright 2016 Society of Nuclear Medicine and Molecular Imaging, Inc.
Khoshnevisan et al. investigated NIS-mediated [18F]FSO3- uptake in cultured NIS-expressing cancer cells and in vivo biodistribution in normal BALB/c mice (Figure 5). [18F]FSO3- exhibited a comparable affinity with [18F]TFB in a competitive binding assays using hNIS-transduced HCT116-C19 cells, and showed a promising specific uptake in NIS expressing tissues in PET/CT imaging and biodistribution. Although the high molar activity [18F]FSO3- could greatly avoid the saturable effect in NIS imaging, a moderate amount of bone uptake was also observed, indicating in vivo defluorination of the probe. As a promising NIS probe, [18F]TFB has been evaluated as a gene reporter probe for monitoring of NIS expression in several approaches where the NIS gene is transfected or transduced into living cells. Weeks et al. evaluated the affinity of [18F]TFB accumulation in a transfected human colon cell line with a stable constitutive expression of functional hNIS (HCT116-hNIS-C19). [18F]TFB accumulation in HCT116-hNIS-C19 cells (31%) was comparable to that of [188Re]perrhenate (41%) and [99mTc]TcO4- (46%). Jiang et al. reported [18F]TFB PET imaging in mice bearing NIS-expressing C6 glioma xenografts, with NIS-positive and NIS-negative tumors implanted on opposite flanks (Figure 6). In the PET images, high contrast was observed in the uptake of NIS positive tumor over that of NIS negative tumor. [18F]TFB uptake was found to decrease in iodide-accumulating tissues in mice as a function of molar activity (Figure 6C-E). Stomach uptake was independent of molar activity of [18F]TFB whereas uptake in hNIS-expressing tumor and thyroid were decreased with decreasing molar activity of [18F]TFB. 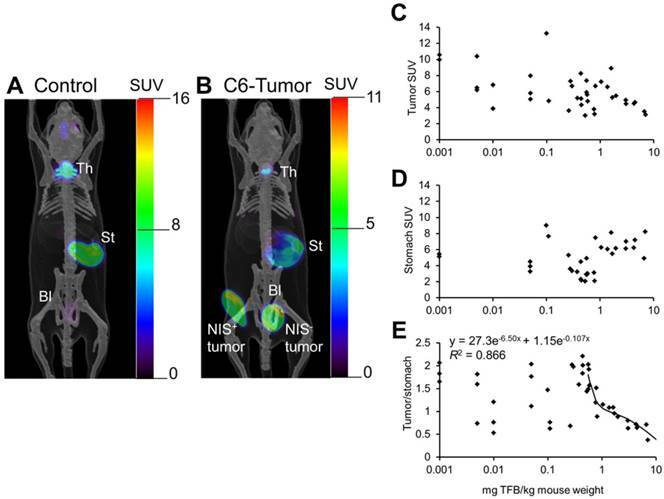 The uptake of [18F]TFB in hNIS expressing C6 tumor showed dependence on molar activity at 10-0.5 mg of TFB/kg of mouse weight or 0-10 MBq/μmol, considering ~1.1 MBq radioactivity was injected in ~25 g mice. But this trend was not observed for higher molar activities (>10 MBq/μmol TFB or <0.5 mg TFB/kg mouse weight). At these higher molar activities, the uptake of [18F]TFB was no longer dependent on molar activity but exhibited high variability, possibly due to variable NIS-expression in the tumors. These results were consistent with the observations of Khoshnevisan et al. on the dependence of [18F]TFB uptake by thyroid on molar activity in normal mice. Jiang et al. also investigated [18F]HFP with in vivo PET imaging (Figure 7) and biodistribution in a C6 glioma xenograft mouse model. [18F]HFP showed robust uptake in NIS-expressing tissues and good in vivo stability. Despite the moderate molar activity of [18F]HFP, the specific accumulation in hNIS-expressing xenograft (hNIS+) was observed clearly relative to isogenic control tumor (hNIS-). The uptake of [18F]HFP in NIS-expressing tissues was successfully blocked by the pretreatment of NaClO4. It was postulated that the 14-150-fold higher affinity  of the PF6- relative to endogenous iodide or other endogenous NIS substrates may render [18F]HFP less sensitive to competition effects by other anions in the body. PET images of [18F]TFB distribution at 60-70 min in (A) control mouse and (B) mouse bearing hNIS-positive and hNIS-negative C6-glioma xenografts. Overlaid reference bone atlas is computer generated. Bl: bladder; St: stomach; Th: thyroid. Dependence of (C) tumor, (D) stomach, and (E) tumor-to-stomach ratio of [18F]TFB uptake at 60-70 min on administered mass of TFB to hNIS-expressing C6-glioma xenografted mice. Tumor-to-stomach ratio data for administered mass greater than 0.5 mg/kg was fit to a biexponential clearance model using nonlinear least-squares regression. Reproduced with permission from , copyright 2016 Society of Nuclear Medicine and Molecular Imaging, Inc.
Representative PET images of [18F]HFP at 50-60 min post-injection in a mouse bearing hNIS+ and hNIS- C6-glioma xenografts. The overlaid reference bone atlas is computer generated. (A) [18F]HFP in unblocked mouse; (B) [18F]HFP with pretreatment of NaClO4 (250 mg/kg). Th: thyroid, St: stomach, Bl: bladder. Yellow arrows designate the location of hNIS+ tumor. White arrows designate location of hNIS- tumors without detectable uptake of [18F]HFP. Reproduced with permission from , copyright 2018 Elsevier. Measles virus-expressing NIS (MV-NIS) treatment allows real-time in vivo imaging of viral replication. After 2 weeks of MV-NIS therapy, osteosarcoma xenografts were imaged by PET/CT after [18F]TFB administration. In contrast to MV-NIS-treated animals (right panel), no significant uptake was seen in control virus-treated mice (left panel). Reproduced with permission from , copyright 2014 Springer. Domingo-Musibay et al. reported the use of [18F]TFB in the monitoring NIS reporter gene virotherapy (Figure 8). To evaluate the antitumor efficacy of virotherapy with engineered measles virus (MV) NIS-expressing (MV-NIS) vaccine strains for the treatment of osteosarcoma. The [18F]TFB uptake was clearly observed in active MV-NIS-infected tumors in contrast to tumors treated with inactive virus on PET/CT imaging. Based on these encouraging results, [18F]TFB imaging of NIS reporter gene is warranted in further preclinical and clinical virotherapy studies. NIS has been used as a reporter gene in cell tracking studies, which was successfully monitored by iodine-124 PET imaging . Based on their previous work, Lee et al. explored [18F]TFB PET imaging in the tracking of dendritic cell (DC) migration by transfection of murine DC cell lines with hNIS and effluc genes (the latter were monitored by bioluminescence imaging). To monitor the migration of DC cells toward draining popliteal lymph nodes (DPLNs), parental cells were subcutaneously injected into footpads. Immigration of DCs to lymph nodes was successfully monitored using [18F]TFB PET/CT at day 2 imaging and the results were consistent with bioluminescence imaging (Figure 9). These data supported the feasibility of using [18F]TFB for hNIS reporter gene imaging to track the migration of DCs to lymph nodes. In this study, 1×107 cells were contained in the injectate administered to the footpads. Thus, this study begins to provide data on the limits of sensitivity of the [18F]TFB in the application for reporter gene imaging. The ability to monitor NIS expression by PET is likely dependent on a number of factors, including tissue perfusion, density of NIS-expressing cells in target tissue, expression levels of NIS within the cells, molar activity of radiotracer, presence of competing substrates, injected dose, uptake of radiotracer in surrounding background tissues and imaging characteristics of the PET scanner. Preclinical imaging studies using cancer cells engineered to express reporter genes can provide valuable information on the regional and temporal aspects of tumor metastasis. Diocou et al. recently reported the use of [18F]TFB for metastasis detection in a NIS-expressing orthotopic xenograft breast cancer model (Figure 10). Conventional radiotracer [123I]iodide (SPECT/CT) and [18F]FDG were used to compare with [18F]TFB PET/CT imaging. [18F]TFB exhibited high specific uptake in tissues with cancer cell presence. 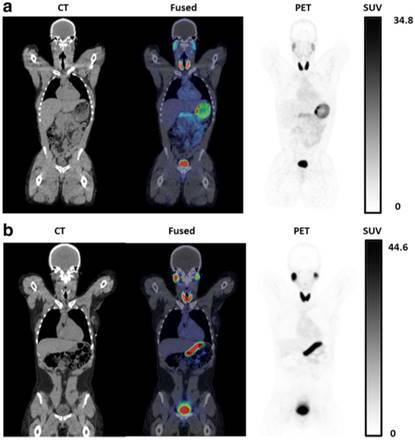 Superior imaging properties for [18F]TFB PET/CT and higher tumor:blood ratios were found relative to [123I]iodide SPECT/CT due to faster blood clearance of [18F]TFB and the inherently higher imaging sensitivity of PET. [18F]FDG PET was unable to differentiate the metastases due to low uptake and poor contrast from adjacent metabolically active tissues. The promising properties of [18F]TFB as gene reporter probe warrant further investigation of [18F]TFB in both preclinical and translational studies. In vivo combined bioluminescence (BLI) and [18F]TFB PET/CT imaging of DC migration after their subcutaneous injection into footpads. 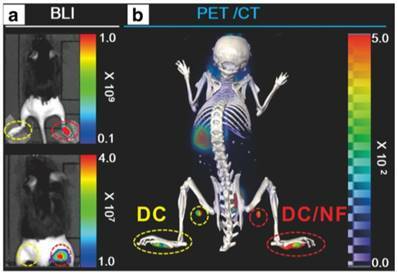 (A) In vivo BLI (upper panel: without masking the footpads; lower panel: after masking the footpads) and (B) [18F]TFB PET/CT imaging of DC/NF cell migration to the DPLNs after their injection into mouse footpads. Reproduced with permission from , copyright 2017 Springer. Large animal model investigations with [18F]TFB may take advantage of the accurate quantitation afforded from measured attenuation correction. Hickey et al. reported on the application of [18F]TFB PET/CT imaging as a NIS gene reporter in hepatocyte gene therapy to correct the metabolic disorder in fumarylacetoacetate hydrolase-deficient (Fah-/-) pigs, a large animal model of hereditary tyrosinemia type 1 (HT1). In this study, hepatocytes were transduced with one or both of the lentiviral vectors expressing the therapeutic Fah and reporter NIS genes, and transplanted into livers of Fah-deficient pigs. As shown in Figure 11, higher [18F]TFB uptake was observed in the liver of pig Y842 (denoted in purple) than wide type, which demonstrated near-complete liver repopulation by gene-corrected cells. The results showed that NIS is a suitable noninvasive reporter for future cell transplantation studies. The low uptake of [18F]TFB in normal liver facilitated detection and quantification of low levels of NIS-dependent activity within the NIS transfected therapeutic cells. And the results showed the promising future of using [18F]TFB to monitor NIS gene reporter in hepatocyte gene therapy. Marti-Climent et al. reported the first PET evaluation of [18F]TFB in non-human primates. In this study, whole-body PET imaging was done in two male Macaca fascicularis monkeys. [18F]TFB PET images (Figure 12) clearly delineated the thyroid with excellent resolution. Following a rapid vascular clearance phase, a great majority of the radiotracer was localized in NIS-expressing organs (thyroid, salivary glands and stomach) or excreted in the urine. Dosimetry estimates suggested that [18F]TFB delivered an effective dose slightly higher than the dose produced by [99mTc]TcO4-, but much lower than that produced by radioiodine in the form of [131I]NaI, [123I]NaI or [124I]NaI. This successful [18F]TFB PET/CT imaging in non-human primates encouraged researchers to pursue the effectiveness and safety evaluations of [18F]TFB in human subjects. Given the excellent properties of [18F]TFB as a NIS imaging radiotracer evidenced in the preclinical studies, further evaluation of [18F]TFB in humans has been initiated. Jiang et al. reported the first [18F]TFB evaluation in 8 healthy human subjects (4 male, 4 female) utilizing the BF3 synthesis method (Figure 13). Molar activities of [18F]TFB at injection were approximately 3 GBq/μmol. Safety, pharmacokinetics, biodistribution, stability and radiation dosimetry of [18F]TFB were assessed by dynamic and whole-body static PET/CT scans over 4 h after intravenous administration. Overall, [18F]TFB administration was well tolerated with no significant findings on vital signs and no clinically meaningful changes in clinical laboratory assays. Uptake of [18F]TFB was observed in well-known NIS-expressing tissues (thyroid, salivary glands and stomach). The left-ventricular blood pool time-activity curves early after injection showed a multiphasic blood clearance of radiotracer with two rapid clearance phases over the first 20 min, followed by a slower clearance phase. HPLC analysis showed excellent tracer in vivo stability in the blood and urine over the length of 4 h study. High uptake in thyroid supports further evaluation of [18F]TFB in thyroid related disorders. Low background uptake in liver, skeletal muscle, cerebral cortex and other low NIS-expressing tissues will allow evaluation of NIS gene expression in these tissues, whereas the few tissues with high uptake (thyroid, salivary glands and stomach) will be disadvantaged for assessing NIS reporter expression. O'Doherty et al. reported the first [18F]TFB PET imaging results in thyroid cancer patients (Figure 14). For this study, [18F]TFB was administrated with molar activities of 2.6±1.4 GBq/μmol at time of injection. Dynamic whole-body imaging in five patients showed the rapid clearance of radiotracer from the circulation with excellent target-to-background ratios in NIS-expressing tissues (thyroid, salivary glands, stomach) within 30-45 min post-injection. Thyroid tumor nodules (13-114 mm maximum diameter) were found to be photopenic against the higher background [18F]TFB uptake in normal thyroid, consistent with lower hNIS expression in differentiated thyroid cancer (DTC) relative to normal thyroid. No significant changes in vital signs or electrocardiograms were observed. Radiation dosimetry estimates were found to be similar as many other fluorine-18 labeled radiotracers. 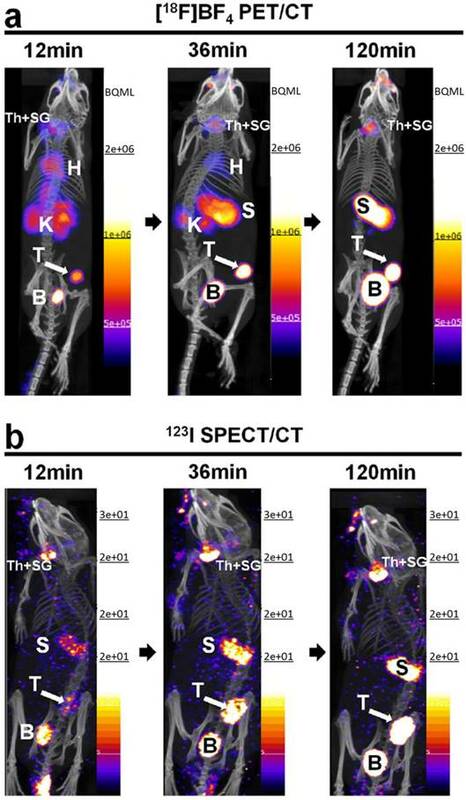 Comparative in vivo NIS imaging indicates differences between the PET tracer [18F]TFB and the SPECT tracer [123I]iodide. Tumors were grown to sizes of ~350 mm3 before being imaged by either (A) [18F]TFB-PET/CT or (B) [123I]iodide-SPECT/CT. Dynamic PET data were binned into time intervals comparable to sequential SPECT images. All images are maximum intensity projections overlaid on CT. Abbreviations are: bladder (B), heart (H), kidney (K), stomach (S), thyroid and salivary glands (Th + SG), and primary tumor (T). Representative images of cohorts of N = 3 are shown. Reproduced with permission from , copyright 2017 Springer Nature. Representative transverse PET/CT images of a control WT pig and pig Y842 after injection of [18F]TFB. Different positions of the liver are shown from head (left side) to feet (right side) of the animals. The relative intensity of [18F]TFB uptake is represented by low (blue) to high (red). The liver is outlined in purple, and the spleen is outlined in white. Reproduced with permission from , copyright 2016 Science Translational Medicine, an exclusive license. [18F]TFB biodistribution in macaque. Maximum-intensity projection PET images of the [18F]TFB radioactivity at different time points after intravenous injection. Time information corresponds to the mean frame time. Reproduced with permission from , copyright 2015 Springer. 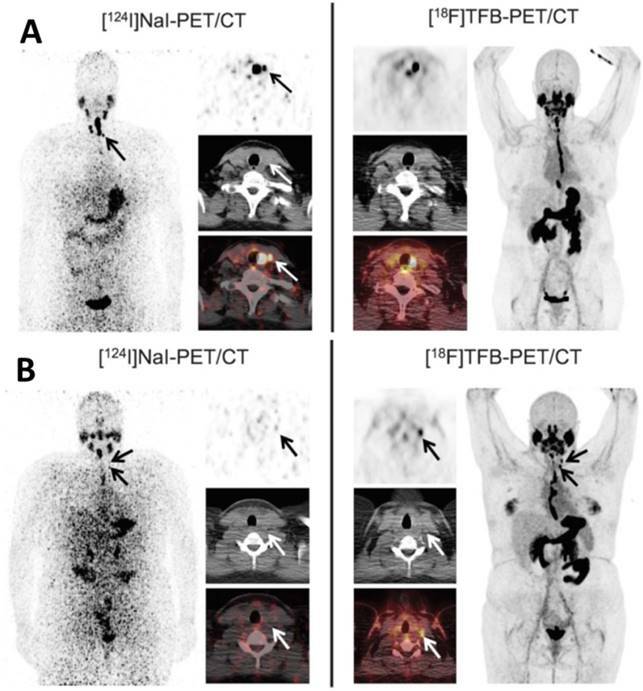 Coronal PET/CT images of [18F]TFB in healthy (A) male and (B) female participants at 2 h post-injection. Physiologic distribution of [18F]TFB is seen in the thyroid, salivary glands, stomach, and intestines. Prominent excretion of radioactivity was seen in the urinary bladder. Reproduced with permission from , copyright 2017 Springer. Decay-corrected serial maximum-intensity projections showing biodistribution of [18F]TFB over the course of the imaging study. Thyroid, salivary gland, and stomach activities increased rapidly with time up to 30 min. Reproduced with permission from , copyright 2017 Society of Nuclear Medicine and Molecular Imaging, Inc. Comparison of local thyroid remnant detection by [18F]TFB- and [124I]NaI-PET/CT. Display of maximum intensity projections (outer columns) and transaxial PET and combined PET/CT slices (inner columns). (A) [124I]NaI- and [18F]TFB-PET/CT in the 56-year-old patient with DTC presented after total thyroidectomy (pT1b). [124I]NaI- and [18F]TFB-PET/CT revealed remnant benign thyroid tissue in the thyroid bed and along the thyroglossal duct with 2 foci of remnant tissue missed by [18F]TFB (arrows). No lesions suspicious for malignancy were detected. (B) Example of a 26-year-old patient after total thyroidectomy with PTC metastases exclusively detected using [18F]TFB-PET/CT. Beside a local thyroid remnant, [18F]TFB-PET/CT confirmed ultrasound results by revealing 2 cervical LNs in the left lateral compartment with focally increased uptake, consistent with metastatic disease (arrows). In contrast, [124I]NaI-PET was unremarkable for malignancy. Because of the discrepant findings, left lateral LN dissection was performed and yielded 6 additional cervical (micro-) metastases. Reproduced with permission from , copyright 2018 Wolters Kluwer Health, Inc.
More recently, Samnick et al. reported a comparison study of [18F]TFB and [124I]NaI PET/CT in nine newly diagnosed DTC patients after total thyroidectomy (Figure 15). PET/CT scans were analyzed for the presence of remnant thyroid tissue and metastatic DTC lesions. Overall, both tracers identified a similar biodistribution pattern and an almost equal number of tumor lesions in a lesion-based analysis ([18F]TFB: 41; [124I]NaI: 40). Retention of iodine-124 in the remnant thyroid tissue was found to be significantly higher than that of [18F]TFB, which is probably reflective of organification of iodide in thyroid cells. In a single patient, [18F]TFB missed two iodine-124-positive benign thyroid remnants (Figure 15A). However, [18F]TFB demonstrated higher accumulation in DTC metastases. For example, [18F]TFB demonstrated additional iodine-124-negative cervical lymph node metastases in 2 patients (Figure 15B). The difference in overall agreement between the radiotracers of 91% (74/81 foci) may reflect the aforementioned difference in organification of radioiodine versus lack of organification of [18F]TFB as well as the earlier imaging time point of [18F]TFB (40 min post intravenous administration versus 24 h post oral administration for [124I]NaI). It was concluded that [18F]TFB PET was not inferior to [124I]NaI PET for detecting DTC and its metastases at this point, and may have superiority for detection of [124I]NaI PET-negative metastases in addition to the practical advantages of using a readily synthesized fluorine-18 radiotracer over the less available and more costly iodine-124. These early human studies show [18F]TFB kinetics and biodistribution to be similar to [99mTc]TcO4-, and that it exhibits higher accumulation in differentiated thyroid cancer metastases . In this regard, [18F]TFB may be favorable to radioiodide for clinical assessments by PET imaging of NIS expression in thyroid-related disorders. The safety assessments of [18F]TFB have shown it to be pharmacologically safe in humans, and radiation dosimetry is on par with other greatly excreted fluorine-18-labeled radiopharmaceuticals, such as [18F]FDG. These results warrant further Phase 2 trials for [18F]TFB as a NIS imaging probe. Indeed, another study of [18F]TFB PET imaging with thyroid cancer patients has been initiated by Memorial Sloan Kettering Cancer Center . There are ongoing studies at Mayo Clinic to perform [18F]TFB imaging in cancer patients undergoing treatment with oncoviruses engineered to express the NIS reporter . These phase 2 trials are necessary to support future regulatory submissions on the use of NIS reporter gene in virotherapy. With regard to the dependence of [18F]TFB imaging characteristics on molar activity, more data is required in humans to understand this relationship. As noted, the previously discussed studies used preparations that resulted in human administration of [18F]TFB at similar molar activities of approximately 3 GBq/μmol [20, 21]. This level of molar activity is achievable with the isotope-exchange method or BF3-based radiosynthesis methods, although in our hands, we are able to achieve ~2-fold higher radiochemical yields and ~5-fold higher molar activities with the BF3-based method, which may allow for longer delays between end of synthesis and radiotracer administration. Obviously, further work is required to define recommended minimum molar activity levels to avoid saturation effects at NIS transporters and maintain target-to-background characteristics. NIS has been extensively evaluated as a target for therapy and reporter gene in the last two decades after the cloning of the NIS gene. 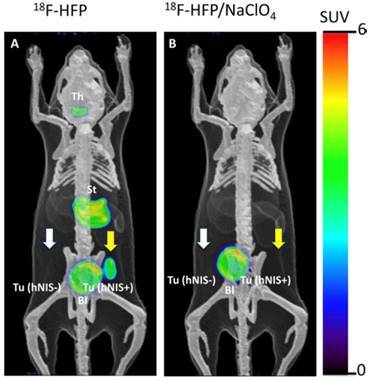 The introduction of [18F]TFB for PET imaging of NIS-expressing tissues may allow imaging assessments to be improved over conventional imaging with SPECT or PET iodide probes. The simple synthesis methods established for preparation of [18F]TFB are amenable for production in existing medical cyclotron facilities and fluorine-18 radiopharmaceutical distribution centers. [18F]TFB may have limited availability in medical centers not equipped with a medical cyclotron. However, this should not be a big concern because a distribution approach can solve this problem owing to the favorable half-life of 109.8 min, and this distribution model has been proven to be very successful with [18F]FDG. In light of its excellent preclinical and preliminary clinical evaluations, we can expect that translational studies with [18F]TFB will continue to improve the further advancement of NIS imaging in thyroid disorders (e.g., differentiated thyroid cancer and metastasis of thyroid cancer) and NIS reporter gene imaging (e.g., viral-mediated gene therapy, oncolytic viral therapy and cell trafficking). The excellent results in recent clinical studies also imply that [18F]TFB has the potential to offer alternative options to [99mTc]TcO4- or radioiodides for clinical NIS imaging using SPECT and PET. Thus, [18F]TFB and closely related compounds under investigation have the potential to expand the role of NIS in nuclear radiology in the future. BF3: boron trifluoride; CT: computed tomography; DC: dendritic cell; DPLNs: draining popliteal lymph nodes; DTC: differentiated thyroid cancer; EOS: end of synthesis; FDG: fludeoxyglucose; FSO3-: fluorosulfate; GMP: good manufacturing practices; I-: iodide; K.2.2.2: Kryptofix® 2.2.2; MV: measles virus; NIS: sodium/iodide symporter; NMP: N-methylpyrrolidine; PET: positron emission tomography; PF6-: hexafluorophosphate; QMA: quaternary methyl ammonium; SPECT: single photon emission computed tomography; TcO4-: pertechnetate; TFB: tetrafluoroborate. This work was supported by the NIH/NCI CA196975-01.